A common, hot capsicum pepper native to Mexico. 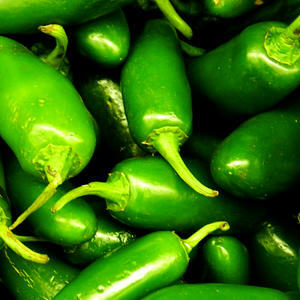 While jalepeños, like most peppers of the Capsicum family, can range in color from bright greens to deep reds, most jalepeños are considered perfectly ripe when they are dark green, medium-sized, firm, and pull easily from the plant. Jalepeño plants are quite prolific and grow easily across the South. The jalepeño is considered to be a medium-hot pepper and falls anywhere from 1,000-20,000 units on the Scoville heat index. Jalepeños can be served raw (especially in salsas or Vietnamese pho), minced and sauteed into dishes for flavor and heat, pickled, fried, jellied, roasted, or stuffed. Jalepeños are usually deseeded because the seeds hold the bulk of the fire and bitterness. Whenever handling jalepeños, it's important to wash your hands in cold water immediately after and to avoid touching your eyes and other sensitive areas. For the best way to remove the seeds from this fiery chili, check out this chef tip.